Dr. Leo Stanton Rowe, Director General of the Pan American Union, photographed with Julio Barata, Director of the Radio ..
United States -- Washington, D.C. 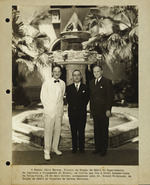 Most photos include Dr. Leo Stanton Rowe, Director General of the Pan American Union. It is unclear how these may be related to the Dominican Republic Settle Association. It is likely that whoever owned the scrapbook, also possessed these photographs. Collection Name: Dominican Republic Settlement Association Anniversary Scrapbook and Photographs.